Oyster Bah is one of the newest Lettuce Entertain You restaurant in town, and it's just a stone's throw from other Lettuce restaurants Summer House and Stella Barra. The stretch of Halsted just south of Armitage is now home to the three restaurants, but they're all pretty unique. Oyster Bah focuses on seafood (obvi), and claims to have the freshest oysters in town. Do they? Well, I stopped in last week to find out. The decor is very casual and nautical, and the restaurant is not huge. I highly recommend making a reservation if you can. There's also another dining room located downstairs called the Crab Cellar, which is a smaller room serving the same menu, and also provides an area to wait for your table upstairs. The night I dined, the restaurant was jam packed and we had to wait about 10 minutes even though we had a reservation. Oyster Bah has only been open a few weeks, so this was kind of expected. We ordered cocktails since we heard they were great, and our server really sold us on them. I tried the Nor'easter with rye, Vermont maple syrup, ginger beer, lime and Boston bitters, while my co-taste tester tried the Pearl in the Park with gin, lemon, pear syrup, and cava. Her's was too sweet and syrupy, and mine was just lackluster. On that note, I'd skip the cocktails next time. We ended up enjoying a glass of cava afterward, and there are plenty of seafood-friendly wines to choose from, by the glass and bottle, as well as can and draft beers. 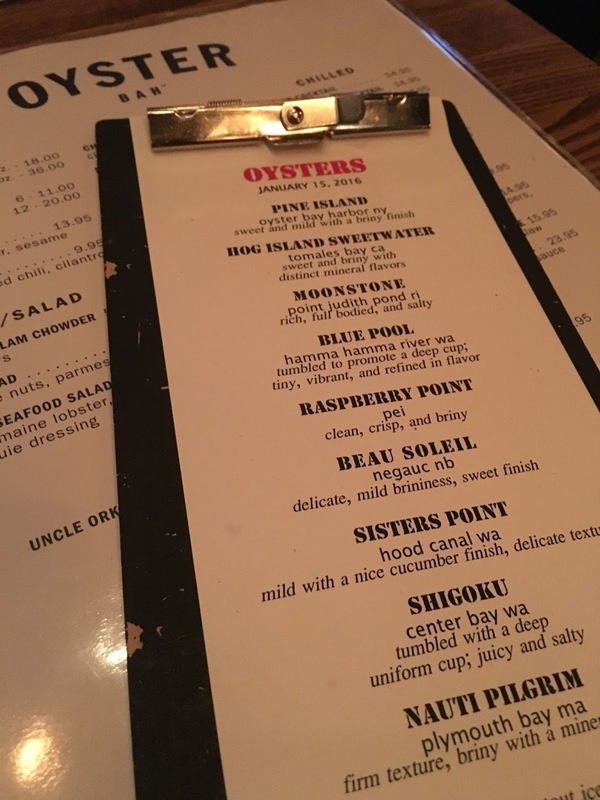 Oyster Bah features oyster selections that change daily. The night we were there, there were seven varieties, a mix of East and West Coast. We ordered a half dozen of the Hog Island Sweetwaters, and Shigoku oysters. The Hog Islands were amazing. Super plump and fresh, and when I slurped them down they tasted like the ocean. Yum. The Shigoku's were OK. Not bad, but I prefer the bigger, plumper varieties, and these were some little oyster dudes. Were they the freshest oysters in Chicago? Based on the Hog Islands, oh yea. Our server also told us we had to try the oyster shooter. I'm a huge oyster lover, but oddly enough had never done an oyster shooter before. You basically slurp the oyster on top, and chase it with the vodka and tomato concoction. I'm not really sure what was in that cup, but I did not like it. I don't like Bloody Mary's and it looked like one, so that may have killed it for me. 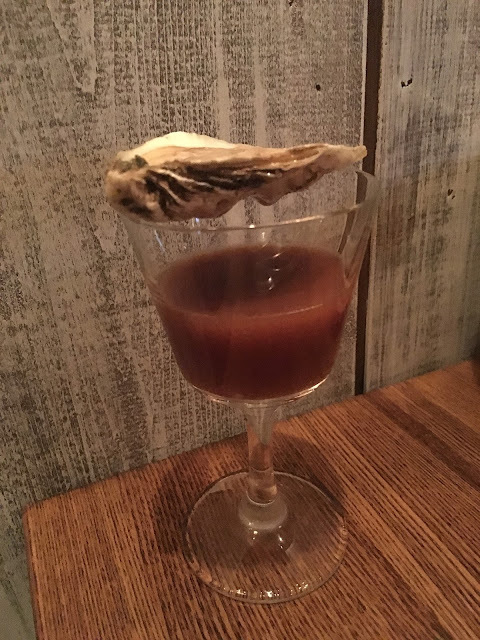 If you like Bloody's and oysters, give it a go. While waiting for our entrees, we snacked on cheesy garlic bread, which you can't really mess up. It smelled incredible. The bread was toasted ciabatta and it was topped with the perfect bubbling layer of garlic and cheese. It's not the same, but eating this gave me flashbacks to the original Bub City in the early 90s. Their garlic bread was amazing, although it didn't have cheese if I remember correctly. For our entrees, we decided to split two. The first was the signature seafood salad which reminded me a lot of the seafood salad at Joe's (are you sensing a Lettuce Entertain You theme yet?). The kitchen was nice enough to split the salad for us, ensuring we each had ample amounts of seafood on our plate. For $28, you're glad it comes with a healthy portion of seafood. 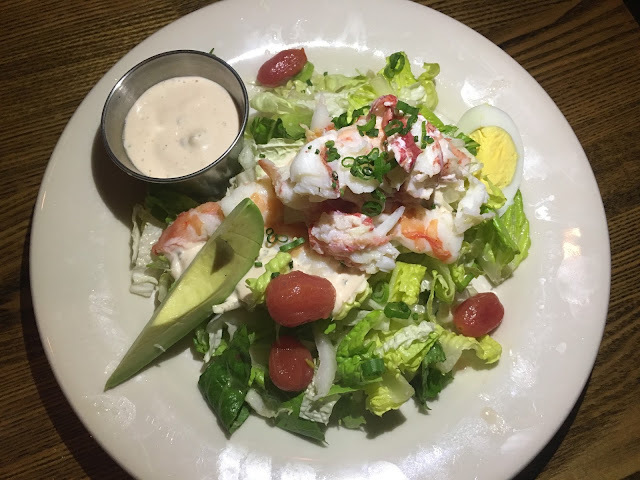 The salad was topped with crab, lobster, and shrimp, boiled egg, avocado, and tomato, and served with Louie dressing on the side. It was so fresh and flavorful, and the dressing was creamy and decadent. Can I have this for lunch everyday? Please? 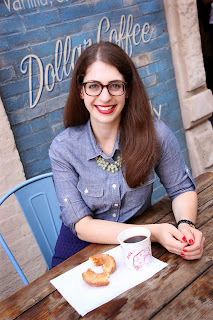 You're probably not surprised to know I do my research before going to a restaurant for the first time (I do work in food research after all!). During my research, I discovered a crowd-pleasing entree, the crispy one-sided red snapper with Thai chili sauce. The fish is served on the bone with one side removed. Yes, you get only half of the fish (that's why it's $28 and not more). The other half is served as a blackened fish entree with dirty rice and a creole lobster sauce. Smart move, Oyster Bah. The red snapper had great flavor and was not too greasy. The fried layer was super thin and added just the right amount of crispy crunch. The Thai chili sauce was brushed on the fish, and we were also given a side of it which I used to dip my fries in. Yep, the fish lays on a bed of crispy fries. I liked the presentation and spice of the fish, and it was super tender and flaky, but I have to say, it was overly salty. I'm sure the fries didn't help either. So, there were some hit and misses during our meal. The cocktails were not great and the fish was overly salty. But the namesake oysters were excellent, as was the seafood salad. I would return for oysters, raw seafood and wine, but only after payday. This place is pricey. Yes seafood is expensive, and you pay for quality, but $7 for bread with garlic and cheese? Yikes. Also, our service was sub-par, especially for a Lettuce Entertain You restaurant, but I'm going to cut them some slack considering they just opened and it was a busy Friday night. I'm giving Oyster Bah 3.5 ghosts out of 5.